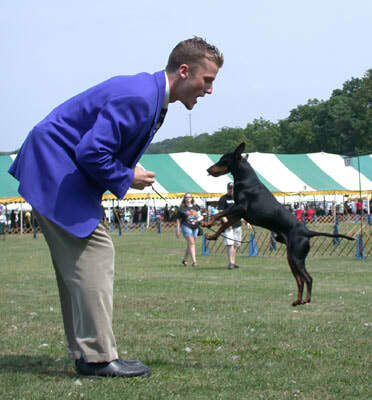 During Jake's career in the United States, he was awarded 267 group placements including 44 Group wins, 6 All-Breed Best in Shows and 5 American National Best of Breeds. Shown just a few weekends in Canada, his wins included 10 group placements, including 4 Group wins and a Canadian National Specialty Best of Breed. Jake took everyone involved in his story on a wild and exciting ride. Shown by Jessy Sutton for his devoted owners, Jim Burrows and Patrick Mackesey (Burmack TMTs), Jake's wins included an amazing 5 US National Best of Breeds, a Canadian National Specialty Best of Breed, a group placement at the Westminster Kennel Club dogs show, multiple US Best in Shows and 7 years as the #1 Toy Manchester in the US including two years among the Top 20 Toy dogs in that country. He also left his mark as a stud dog and can be found in many of the pedigrees of top dogs in North America and around the world. But while his accomplishments as a show dog and stud are many, those who loved him will always remember him best as a kind, sweet gentleman. He was a wonderful ambassador for our breed at a time when Toy Manchesters were not typically competitive in the United States and helped raise the profile of the breed at the group level. Looking back over all of the memories he gave us all, we are most happy and grateful that he lived such a long life and was a treasured companion--which is all that any breeder can ever hope for a puppy. ​Thank you Jim, Patrick and Jessy and, most of all, thank you Jake.